New England is looking at 2 storm systems this Friday and Sunday. These storms will offer a potent mix of snow, ice, sleet, and rain. A deep freeze will then commence Monday which result in a freeze Sunday night. We want you to stay ahead of the storm so today we’re going to talk about how to choose the right melt. This article is a good reference guide for landscape crews and or homeowners. 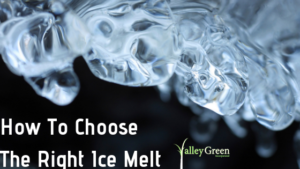 Before purchasing ice melt, you should answer these questions. What surface are you treating? Where will the runoff ice melt go? What is the normal winter climate of the area I am treating? Here are common types of ice melt. If you have a lot of concrete, you should consider mixing your ice melt. Chloride can cause concrete to crack and deteriorate. You can mix the melt with sand which will decrease the amount of chlorine but still provide a decent amount of traction. If you are a maintenance manager of a building that is populated by kids and pets, you might want to consider a nontoxic ice melt. Even rock salt can burn a dog’s paws so consider paying the extra money for ice melt that is considered safe for pets. Plants can also be damaged by salt. The best option for plant safer ice melt is magnesium chloride. You’ll also want to check the melting point of the ice melt. Some types will stop working when the temperature drops below 20 degrees Fahrenheit. This can be a common occurrence in the dead of winter in the northeast. Don’t waste ice melt by using it to melt snow. If possible apply brine to pre-treat surfaces before the snow flys. If it is too late for that, shovel snow away before applying ice melt.